A bit of an unusual day for me at Norton Disney; normally am I riding more horses than other people at these one day events but today I only had one. We had 6 on the lorry but 2 were for Josh, 2 for Jaya (our resident Kiwi) and one for Noor. Norton Disney is a good event, but it was surprising to see parts of the course drying out already and you have a sense of if we have a dry few weeks in April then the ground would turn hard very quickly. One of the highlights of the day was seeing Dotty out enjoying herself again after a long break. As riders and producers of horses it always gives us great joy to see horses doing something they love. In terms of results Josh was the star of the day, finishing second on Ricky on his dressage score of 21. Noor had her lovely new horse Cash in Hand out again and sensibly she is just taking it slowly with him until a partnership really develops. Jaya rode Dotty around the BE100 and Red around the Novice. Red has always been the most genuine horse to ride and produce and it was business as usual again today with him doing everything Jaya asked him to do. Smarty was Josh’s other ride today and he was such a legend, giving Josh another double clear. We are so grateful to Caroline Ryan-Bell for allowing Josh the ride. Smarty and Ricky compliment each other and are just perfect to give someone Josh’s age a little more experience and hopefully head up into Novice level in eventing. My ride today was Noor’s horse Digby and it was a real thrill to ride him cross country. I was enjoying riding him so much that I had to remind myself not to go wrong on course because years of experience have taught me that if I go wrong on course it’s usually because I’m enjoying myself too much. Digby is such a little operator, I really hope Noor let’s me ride him again soon. It won’t be long and we will be back out again at Sapey, and then again at Burnham Market ,so this coming week will only see us at home on Monday and Tuesday. 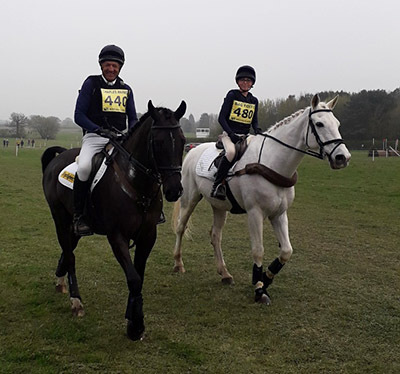 While we were away competing our horses, Jenny was competing a friend’s horses at Aston and by all accounts had a successful day. In typical Levett fashion we were scattered in all directions. It goes without saying that Urssie has been vaulting all weekend, also.